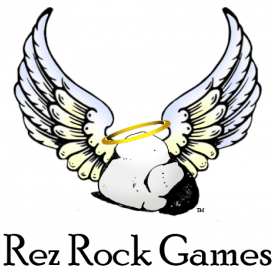 Rez Rock Games is an independent roleplaying game (RPG) producer, specializing in tabletop Roleplaying Games (RPG). RRG was originally founded and created in 2012 by Michael Burgher and Lawrence “Cal” Wiggins. The basic foundation was around wanting to create something of “their own” and not lose control of their project. RRG was created to independently produce games that are fun, energetic, creative, and “free of the business”. RRG exists not on marketing models or what agents say consumers want. It exists to make games that you, the player, wants. RRG was created by gamers for gamers. Independent producing means being a part of the community of gamers at all times. RRG does not spend time in corporate meetings trying vainly to stay awake during marketing PowerPoint presentations. It makes games and plays games. It truly is about being part of the gaming community, a special society of creative minds and people. RRG is continually working to make their games better because we love playing RPG games and we love RPG games. We are gamers. 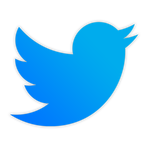 Keep up-to-date with games and the creator’s thoughts by following on Facebook and Twitter. Check out the News to find out what is happening with current and soon-to-be-released games. We are currently working on adding more content to the website, so check back often. Game on and Rez the Rock! Michael Burgher and Cal Wiggins are Veterans of the United States military with a combined service of over 20 years. RRG was originally founded and created deep within the bowels of an Ultra Code-Word Top Secret Communications Facility in Washington D.C. Nights were long and a monkey could do their job – so, naturally boredom set it. They began talking of wealth and riches making their own tabletop RPG. Both Michael and Cal have played RPGs for years and began noodling with the idea of becoming the greatest producers of RPG games in the known universe. And then reality reared its ugly head: You don’t get rich making tabletop RPGs. And so the monkeys flipped a switch. They began to create their own game, using their gaming experience to take what worked and what didn’t work, what they enjoyed and what they utterly despised, and tweaked into something that, in some mutated way, resembled a game concept. The idea was not to get rich but to create something of their own for the sheer fun and love of the game. In a nutshell, RRG was created because two Veterans were near the end of their careers and were utterly bored with a third-rate babysitting job monitoring beeping boxes. It was also because they shared a common interest in a community of gamers. Michael Burgher Michael served with the United States Navy for 8 years (4 active and 4 reserve) before an Honorable Discharge to pursue another career and live in Washington State. He is the brains and technical expert for RRG, spending long hours deliberating over the game mechanics and making it really work. He started playing tabletop RPGs when he was 14. He cut his teeth on Palladium Fantasy, then Pathfinder, Rifts, D&D, and Heroes Unlimited. Michael also plays Magic: The Gathering and is an avid video-gamer, playing everything from RPGs to shooters to MOBAs. Cal Wiggins Cal served with the United States Air Force for 15 years before voluntarily leaving with an Honorable Discharge to attend Seminary in Pennsylvania. 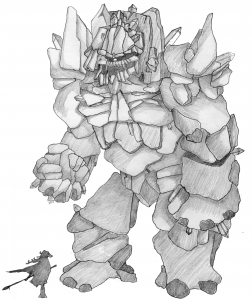 Cal is an artist and writer who puts his skills to use helping develop RRG’s visuals and story. He has played tabletop RPGs since he was 13 and his favorites include D&D, Pathfinder, Call of Cthulhu, and the original D20 Star Wars. Cal also plays Magic: The Gathering and Pokémon. He is also a video-gamer that likes imaginative, customizable RPGs and zombie games.